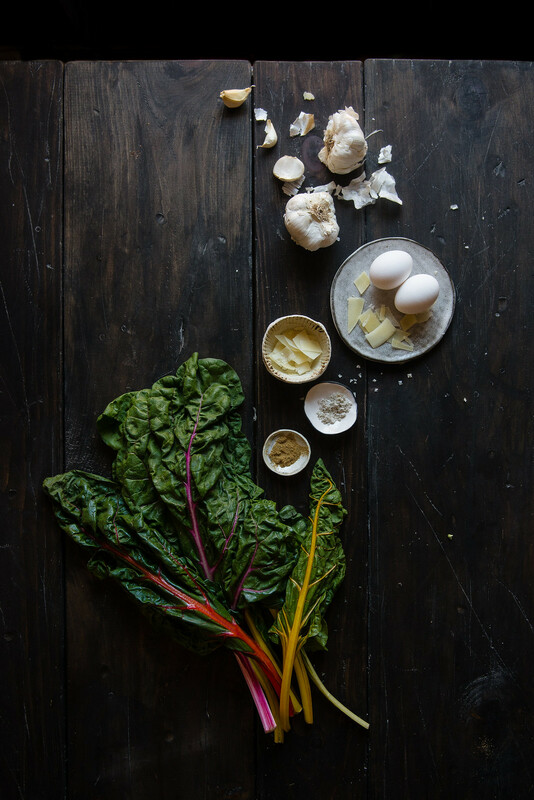 These quinoa cakes are elegantly simple and so delicious — they’re made with little more than a hefty dose of Parmesan, some swiftly sauteed Swiss chard, and a couple of eggs to hold it all together. They’re vegetarian, but the cheese, naturally savory chard, and a dash of cumin give them a surprisingly “meaty” (sorry, is that a gross word for anyone else?) umami quality, especially crisped up in the pan. The egg (you know, whatever’s not on the floor) lends a satisfying staying power that I don’t always find with quinoa-based dishes, and the garlic yogurt on top adds a fun, sour-cream-y piquancy to the whole thing. I think these are delicious on their own, but they’re also fantastic over salad with a little buttermilk ranch, and I can imagine they’d be perfect in a veggie burger (though they’re gluten-free as is!) I’ve been freezing them in two’s and three’s to take to work, and they’re as exciting, flavorful, and not-sad of a desk lunch I could ask for. Also! I fried these up in my new favorite thing — this Lodge seasoned steel skillet! Lodge cast iron has been my true love for ages, and their traditional cast-iron skillet is my go-to for cinnamon rolls, bread rolls, baked oatmeal, perfectly golden pancakes, et cetera, et cetera ad infinitum. But then I tried this seasoned steel skillet and it totally changed my world. 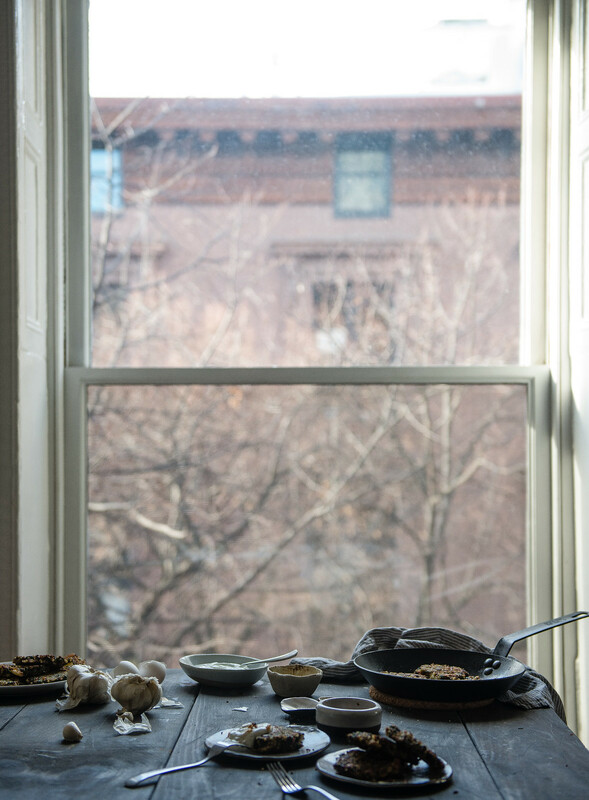 It has all the things I love about my cast-iron skillet — quick, oven-safe heat, a slick non-stick seasoning, the ability to crisp up food like no one’s business — but without the heft that makes cast-iron unwieldy. I’m pretty sure it’s virtually indestructible, meaning you’ll be okay if you drop it like I’ll probably do a bunch of times, and it’s so much lighter weight that I won’t lose any toes if (when) I do. 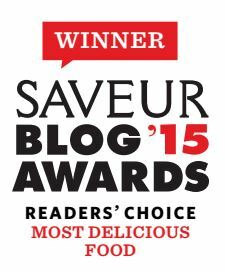 And best of all, the wonderful folks at Lodge are giving away one more skillet! To enter, just leave a comment below with your favorite thing to make in Lodge cookware. 🙂 The giveaway is open to U.S. residents and ends next Wednesday, January 28 at 11:59 PM EST. Yay! This giveaway has closed and the winner is Heather B.! Yay, Heather! I hope you love the skillet!! 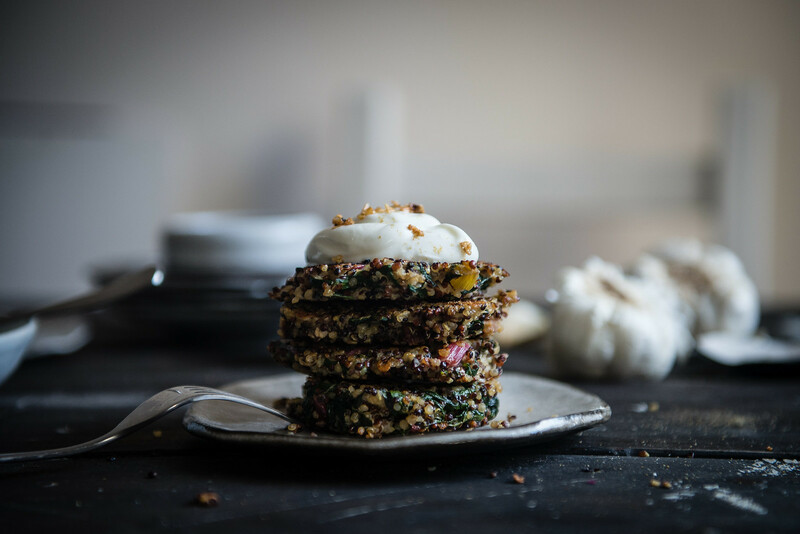 Swiss chard & quinoa cakes, with garlic yogurt. Yield: makes about 6-8 patties, serves 2-3. easily doubled. adapted from Martha Rose Shulman for the NY Times via my awesome friends Sam & AJ! Since it's a little late for Swiss chard season, feel free to substitute with kale or collards. To cook the quinoa: first, rinse the quinoa in a fine metal sieve to reduce bitterness. Bring 1 1/4 cup of water to a boil in a small saucepan or pot with a tight-fitting lid. Add the quinoa, then lower the heat to medium-low, cover, and gently simmer for about 12 minutes, or until all the water is absorbed. Fluff with a fork, remove from heat and let sit, covered, for 15 minutes. Meanwhile, sauté the chard. Heat the garlic and oil in a large wok or saucepan over medium heat until the garlic begins to crackle. 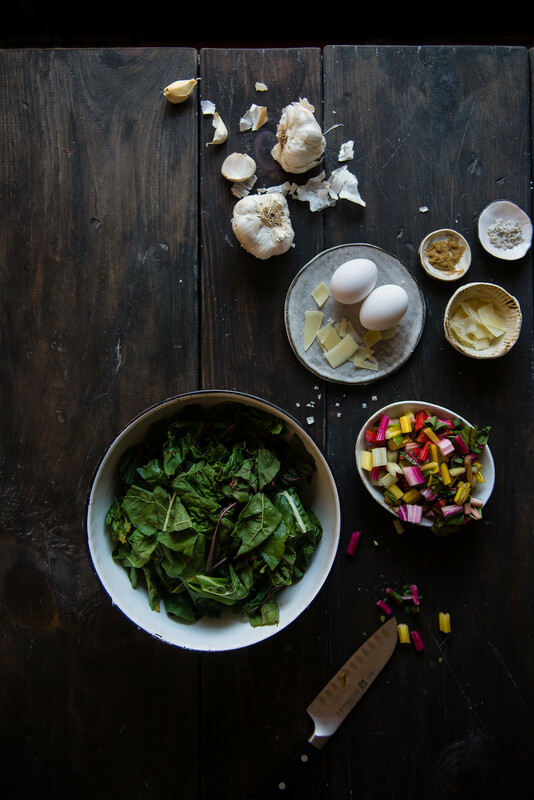 Add the chard leaves only, reserving the stems, and sauté until dark green and soft, seasoning as desired with salt and pepper. Remove the leaves and sauté the stems with a bit of water over medium heat until soft. Set aside and let cool. 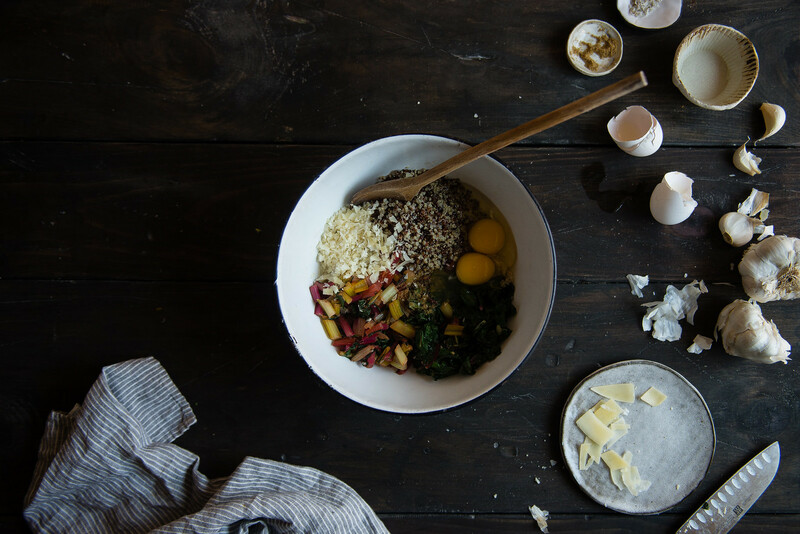 Once all ingredients are cool, place the cooked quinoa, cooked chard, Parmesan, and cumin in a large bowl and mix well. Season to taste with salt and pepper, then add eggs and mix again until well-combined. Chill in the fridge for 30 minutes. 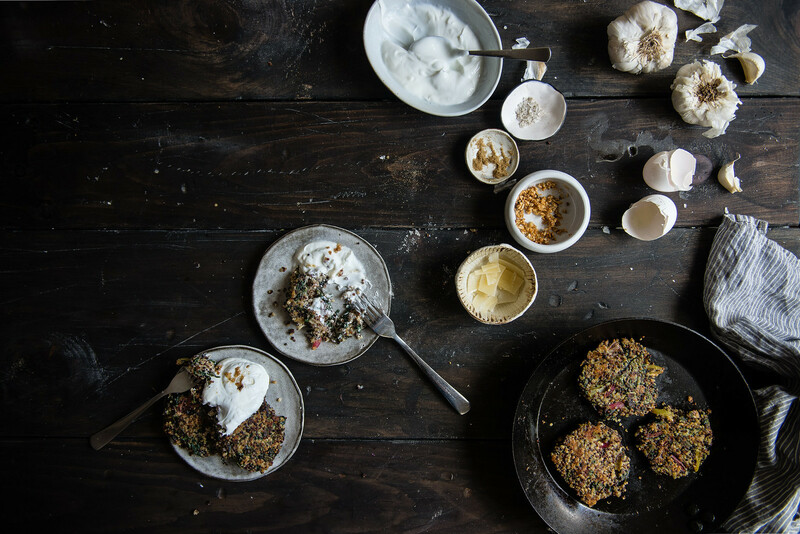 Form handfuls of the quinoa mixture into patties. Heat a few teaspoons of oil in a cast-iron, seasoned steel, or other nonstick skillet over medium heat until shimmering. Add a few patties, leaving room for flipping, and fry for about 2-3 minutes on each side or until golden brown. Reduce heat as necessary to keep from burning. Repeat until all the patties are done. To make the garlic yogurt, stir pureed garlic into yogurt and serve, or briefly panfry minced garlic until crisp and mix in -- either works well. I fried a little extra garlic for topping, too. I increased the number of eggs from Martha's recipe because I found that it helped the patties to keep their shape and liked the extra protein boost it gives them. They're still a little tricky to cook and may fall apart -- if you're having trouble, try adding a tablespoon or two of cornstarch, or even another egg. You can also try making smaller patties, cooking longer before flipping the patty, and flipping only once. dang, those cakes paired with that garlic yogurt look so yummy!! I just love this! Thank you so so much, Katrina!! I know, I’m SO glad my friend introduced these to me! Don’t worry about the ‘clumsy’ bit…I am good at it too that my husband calls me YCO (you clumsy oaf) when I do something really stupid. Its like our private little joke! As for the skillet, I would love to try out an Indian inspired skillet bread. HAHAH oh my gosh YCO!! I definitely need a nickname like that too.. every other day B2 asks with with honest amazement, “How did that even happen?” And I’m like…I don’t even know. Thanks so much for commenting, Dhanya! These look amazing. I’m also very clumsy in the kitchen. I broke a beautiful bowl from Mexico the day i got back from Mexico. Unsalvageable. I drop knives and spill wine. My husband’s and i are amazed at my inability to hold things. Beautiful recipe and photos as usual! Oh NO!!! I know that horrible stomach-dropping feeling so so well. It’s one thing when it’s one of a dozen glass tumblers you got for $1 from IKEA and knew you were bound to break, but when you can’t replace them .. 🙁 So sorry, lady!!! Hopefully you make it back to Mexico soon. Thank you so much for commenting, Amanda! I’d love to make giant skillet chocolate chip cookies in a cast iron skillet! One of my favorite things to eat — and therefore cook — is chicken fajitas with lots and lots of onions (slightly charred, almost caramelized, a little greasy, mmmm). Sour cream and all that stuff are pure extras, if there are enough onions with your chicken. sweet potato hash is my favorite. The lodge gets it crispy and crunchy that a non stick does not get you. Definitely cinnamon rolls. There’s something magical about baking in a cast iron. I love how my eggs always taste a little bit like bacon when cooked in my well-seasoned passed-down-from-grandma skillet. Yum. My favourite thing to make in my cast iron pan is a breakfast dish — grated potatoes, kale, onion and peppers and bacon sautéed in butter then when it’s almost ready, I make some divets to cook my eggs in. Favourite meal ever. I love making cornbread in my cast iron! Lady! Such a pretty post. And I adore cast iron. I use my little minis during the week for baked eggs for one. And the bigger pan for pork chops with thyme and butter…oh! And pancakes, always pancakes in cast iron. I like to make corned beef hash and hashbrowns in cast iron skillets. So delicious! I love how crispy they look from the cast iron pan. Cynthia, you are best brunch cook! So sorry about the mishaps! If it’s any solace, I used to be really clumsy too and totally revert during stressful times. These cakes sound like total perfection and the images are just so moody and special. I love cooking cast iron! Though I’m sure these little cakes will soon be my favorite, right now I most love cooking over-medium eggs in my skillet. I have two Lodge cast iron pans and they stay on top of my stove because I cook EVERYTHING in them. I’d love to try out the skillet. My favorite thing to make in my cast iron skillet is any kind of breakfast hash! Lately it’s sweet potato hash! But also: steak! Homemade corn tortillas are great in the cast iron! 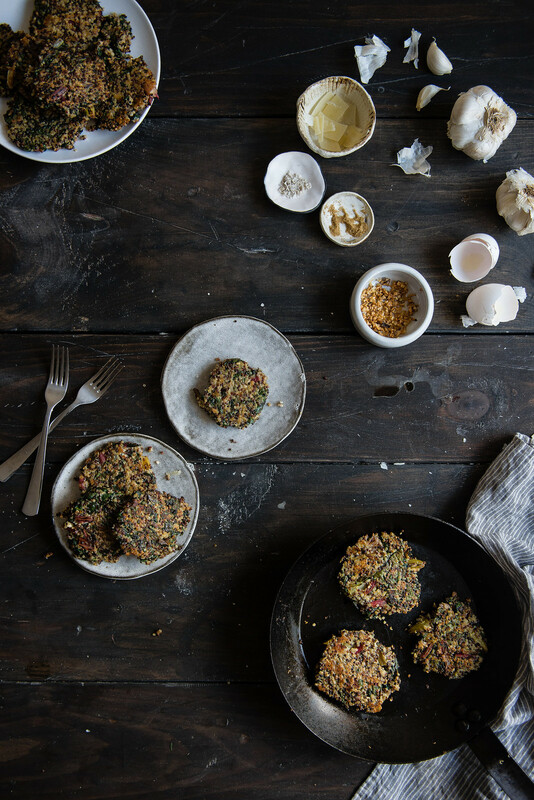 love quinoa patties…best. invention. ever. I love to make chipotle flavored ones and serve them with a blend of greek yogurt and avocado with lime and salt. what i put in the patties depends on what has yet to be used in the refrigerator drawer…but these sound much more sophisticated and I have got to try them out this weekend! Beautiful as always, Cynthia! If I had one of those lovely skillets I’d be making these in a flash. Can’t wait to try out this recipe! Looks lIke a new recipe for a cold winter day. My favorite recipe to make in my Lodge cast iron dutch oven us Sheepherders Bread. Almost five pounds of warm, tender yummiest to chase away thus gray dreary weather. These photos, Cynthia! They’re perfection! I love making German pancakes in my Lodge cast iron, just like my Grandma used to! I would love to make omelettes in Lodge cookware! My favorite thing to make in my large cast iron skillet is Shepherds Pie. Delicious. Those patties look great. I’m always looking for healthier options. Steak is awesome in my lodge grill pan. I love my Lodge Cast Iron. I cook absolutely everything in my cast iron. I love to make “Dump Cake”! Mushroom & chicken sautéed & broiled-stove to oven is the best! My Cast iron is used for everything but boiling. My body even loves the iron boost. Wouldn’t be without it. Chicken thighs with rosemary, shallots, lemon, and a splash of white wine! My grandmother’s Irish soda bread! it gives it the best consistency! i love making risotto in my lodge dutch oven! Hash browns in my Lodge! The best. …but moving on…these look so delicious I wish I had them right now…in front of me…to eat. I’m definitely trying these. Yum. I think it’s the perfect breakfast! 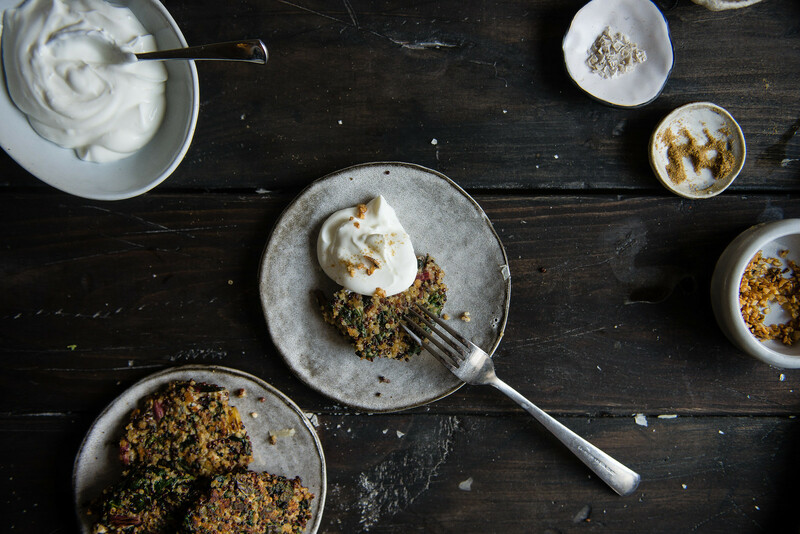 I can’t wait to try these quinoa cakes, they look amazing! As for cast iron skillets, I love using them to make good old fashioned biscuits. Whether I smother them in raspberry jam or fill them with eggs and cheese, they’re always perfect. What a fantastic giveaway! Mexican Sopes! The cast iron gives them the perfect heat for a lightly crisped bottom. I like making a skillet chocolate chip cookie, baking it just until the center is soft/gooey and topping it with ice cream, caramel and chocolate sauce! these look so good! i have such a weakness for savory cakes. nah, they give me strength. it’s not much of a weakness. but i love them so so so. And regardless of whether it’s lighter or not, I hope you don’t drop the skillet on your toes! I love indoor-grilling asparagus and portobello caps! I would love to make socca in this skillet! I don’t currently have a pan that can transfer to the oven. I cook lots of things in cast iron. My favorite sweet is cinnamon rolls filled with almond paste and topped with a cream cheese frosting. My favorite savory is corn bread studded with seasonal farmers market produce, like cherry tomatoes, goat cheese, and corn in the summer and squash and beets in the winter. The cast iron just insulates everything so well. 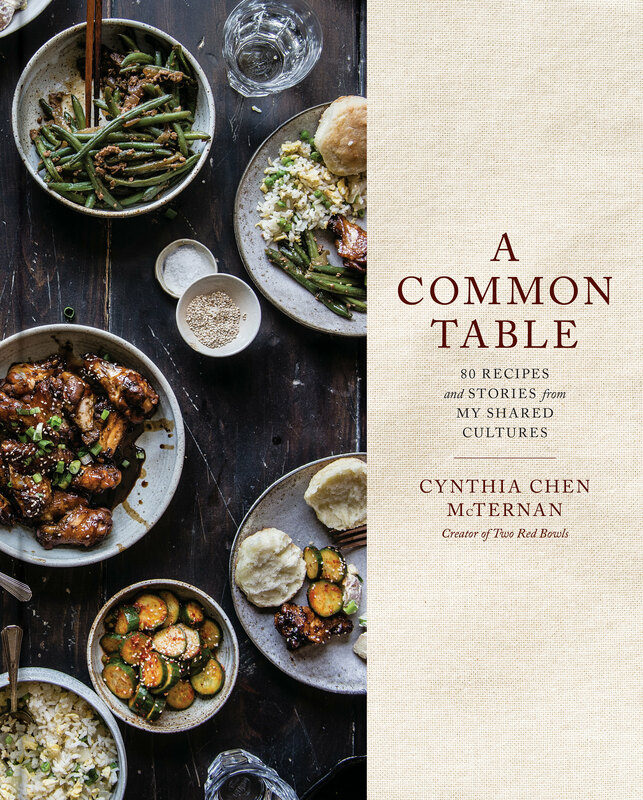 I love to make cornbread, frittatas, and swiss chard sautéed with onions, raisin, smoked paprika and a finishing maple-vinegar drizzle. I like to make jalapeno cheddar cornbread. Cornbread! or a dutch baby for brunch. That third picture taken at the window…booom! Totally mesmerized by it. On another note, I’m sorry to hear about the catastrophes of late but yay for mailing a bunch of invites!! Totally worth the inky legs. It’s getting real, right? I’m a big fan of quinoa patties; they make a really nice lunch, are easy and quick to make, and can be adapted to suit one’s taste and the season. Love the Swiss chard in these! My favorite is Cornbread. It just isn’t right if it isn’t baked in Lodge. I also love to use it for fried chicken. Classic uses, I know, but they’re classic for a reason. I cook parctically everything in my lodge cast iron. Beef strew is my favorite in my dutch oven. I make homemade bread in the loaf pans, and cornbread in my skillet. Could go on forever! Love lodge! We use ours for a lot of different things, but I especially love how easy it is to cook eggs! Yay for mailing invites in spite of all the disasters! 😀 I seriously can’t wait to see your wedding! I’ve always wanted to make those breakaway bread rolls in a skillet. I’ll make lots of omelettes! oh girl, I totally hear you. I have a similar tendency, especially when I am stressed out, thankfully John can calm me down. Aren’t we lucky to have such patient men? So happy to hear the ink didn’t touch your invites 🙂 These quinoa cakes look absolutely lovely!! These look great; there’s so much fresh chard around in the summer that I’m always looking for something new to do with it. As for the skillet, my favorite thing to do with cast iron is to sear meat and vegetabgles for stew. Cast iron makes for some great crustiness to deglaze before slow-cooking a stew, and there’s just no substitute for the flavor it adds. the recipe sounds divine and i hope we find the time to try it very soon. Morning “hash”: potatoes, peppers, onions, garlic, meat or not, with a fried egg. I’d love to make cornbread, both a sweet version with honey and a savory version with peppers and spice! Oh wow, they look and sound just like the food I’m in to. Yummy. Lucky you… but no more accidents ok? This looks like a great “meaty” meat replacement, can’t wait to try. Love that skillet! Fritatas work so well in my lodge pan. My favorite thing to make in my Lodge is my dry rubbed baked chicken! So yummy! Thank you for the giveaway! I absolutely love making frittatas in my Lodge, and it’s a great way to use up all the random bits of cooked veg I find in my fridge to boot! You give me a cast iron skillet and I will always make a frittata. Yum! Hello! I have your recipe saved and the few ingredients that I don’t already own are on my shopping list! Gonna eat well this weekend, thanks to you. For the skillet… currently I’d have to say my favorite thing to make is a Pasta Pizza skillet bake. Depends upon the day just what I want to use the Lodge pans for – the griddle is great for Indian flat breads. The larger skillet is perfect for roasted potatoes with rosemary. The small skillet makes a great toasted cheese sandwich. And I leave the 14″ pizza pan in the oven for every late night pizza craving. I LOVE LODGE UTENSILS! I love making quesadillas in a skillet! Ooooo so hard to decide because lodge is so great to cook everything it! I especially like making super spicy garlicky eggs in purgatory! The sauce gets beautifully caramelized while the eggs turn out perfect! Oooooh these little cakes sound right up my alley! Must make them asap! So sorry about your spills, etc girl…. you’re so cute… don’t sweat it 🙂 Your talents far exceed a splatted egg here or there! PS, I LOVE my carbon steel Lodge pan. Kinda don’t know how I made it 29 years without one! It’s so nonstick and so versatile. Awesome giveaway! Love seeing that little dish on your table 🙂 I use my cast iron to roast chicken, Zuni style. My favorite thing to make is chicken. Yummy! Thanks for the giveaway! what?! I happen to have every single ingredient on this list in my fridge right now. EVEN COOKED QUINOA! Sweet mother of zeus. I’m gonna make these for dinner tonight! Can’t wait to stuff all of them in my mouth! Oh and duh Lodge is THE BEST. I really love their lil pans for heating up coconut oil and cooking a single egg, and I use a big one every day for making things like toasted spicy chickpeas and, um, eggs again! Eggs always. I would make an apple dump cake. It would have to be corn bread since my made it when I was a child. It looks absolutely delicious and so healthy! Omomomomo! I love making cornbread in cast iron. Eggs. Eggs. EGGS. I don’t know what it is, but I love making eggs in cast iron skillets! They never turn out more perfect. I am sooo into garlic yogurt – I made it before with some chopped mint and coriander to have with roasted carrots, nom. I can imagine it being absolutely lush with these cute quinoa cakies! I just made your Baked Oatmeal // Oatmeal Raisin Cookie and it was AMAZING. So so so so good. I would make tons and tons of that in a skillet. we make a LOT of things in our cast iron pans…cornbread, flip-flop pancakes, and fried okra. but my favorite is chicken-fried steak. 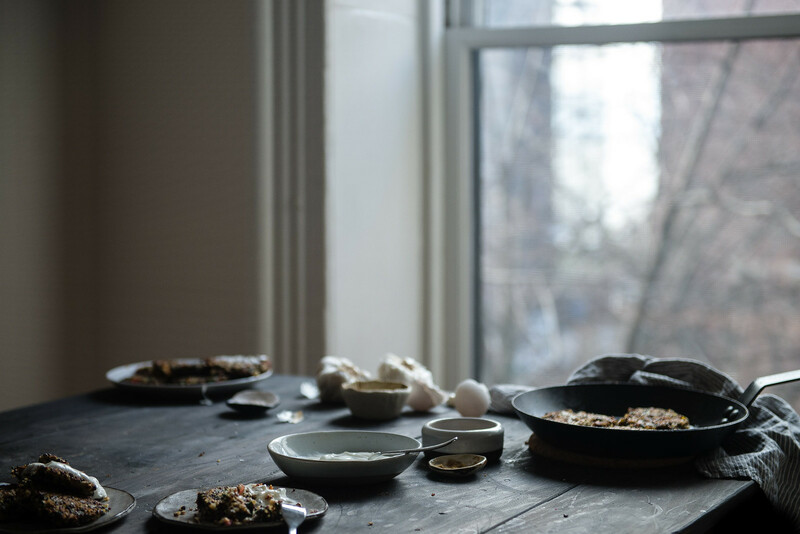 I’d make your dreamy black sesame rolls…spinach spoonbread…and frittatas! These look great! I love any kind of homemade veggie patty – will have to try making them soon. My favorite thing to make in that skillet would be a clafoutis! I’m still working on seasoning the only cast iron I have, and it’s a grill pan so I haven’t been able to try out the 2 recipes I’ve been dying to make in an iron skillet: skillet cookies, and skillet cornbread. I’m dying for a flat pan for those!! Such an amazing recipe! And clumsiness is good, in a lot of ways. It makes you flexible, it’s funny (sometimes), and makes things less formal. And you ARE a good cook too, and you SHOULD have a foodblog like you do, but your friends sound amazing too(: Can’t wait to try these cakes out! I love using cast iron for my jalapeno cornbread and also dutch babies. Your recipe sounds delicious! There are so many things I like to make with my cast iron skillet. So I will go with the classic grilled cheese sandwiches. Thanks for the awesome recipe and giveaway! Cheese, chard, and grains in a patty form?? What more is there to ask for? These are getting made in our kitchen. My favorite thing to make in a cast-iron skillet is bacon-grease cooked brussels sprouts. But I’ve seen recipes for dutch-babies and I have to say, those might be my theoretical favorite thing to cook in a cast-iron skillet. ONE of my favorite things to make is sauteed potatoes. They get nice and crispy! Girrrrl – you and me both. I am so clumsy that my best friend’s family gave me a sippy cup to drink out of after I spilled punch on the carpet one too many times. My husband just looks at me now when I spaz and drop something, “did you have a Sarah moment?” So I FEEL YOUR PAIN. It’s like my arms just forget how to work sometimes. Also – CONGRATS on getting the invites out! 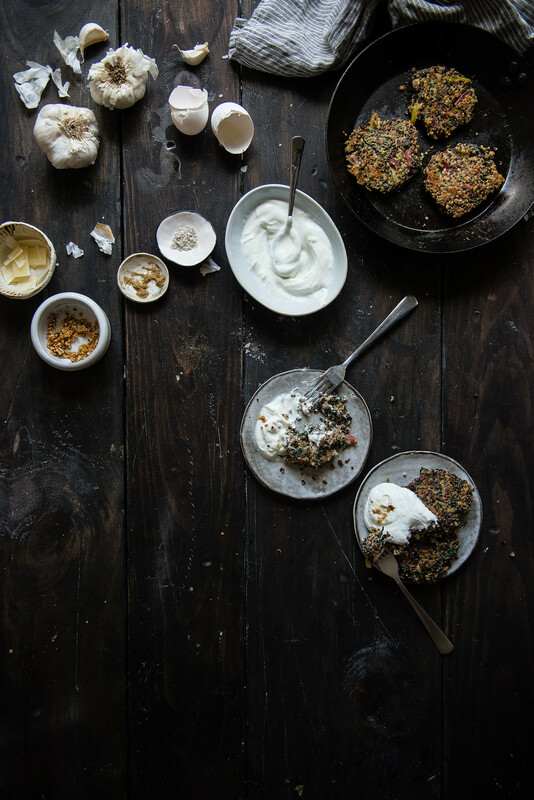 And….these quinoa cakes sound so so good – I’m definitely going to need to make these! I just made these and they were amazing! A keeper. Doubled the recipe and added about a 1/2 cup roasted sweet potato cubes for added colour/flavour. Had some trouble with it sticking to the cast iron pan though. maybe not enough oil? thoughts?